When food meets art. 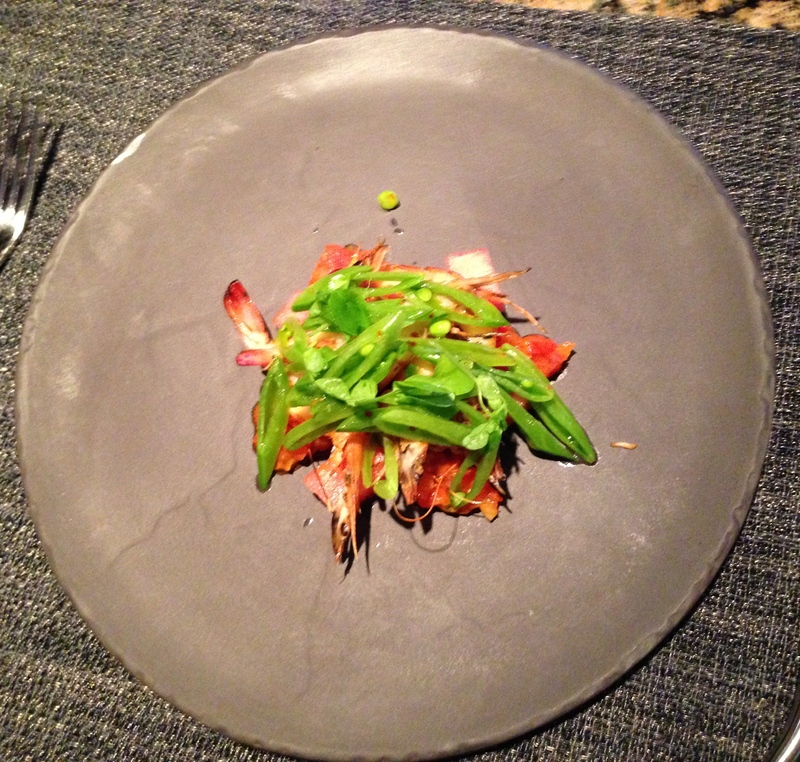 That is what occurs when the chefs at ONE bring their creations to your table. 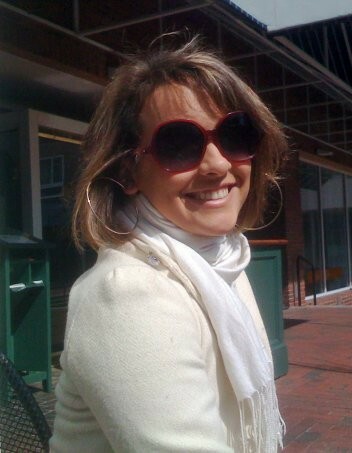 I first went to this restaurant when they opened, about four years ago, and just had one of their signature cocktails, which are praised throughout the town of Chapel Hill. Recently, I was told by several people that I had to try their food as well, as it was considered exceptional – and so I did. There was nothing but amazement at the caliber of cooking and presentation at a restaurant outside of a major city within the United States. I’ve seen high-end quality restaurants in North Carolina, but nothing like this one. 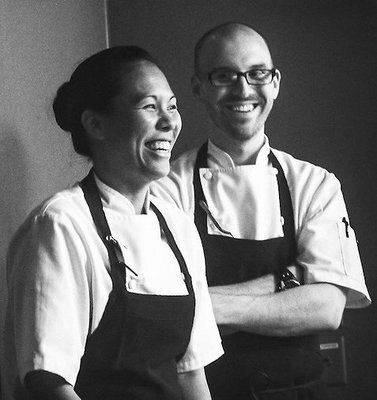 The Executive Chefs, Kim Floresca and Daniel Ryan, bring their experience straight to your table. These two chefs have approximately 26 years of combined restaurant experience; ranging from Per Se (New York), The French Laundry (Napa Valley), Alinea (Chicago), El Bulli (Roses, Spain), and, most recently, at the three Michelin-Star rated “The Restaurant at Meadowood” (Napa Valley – St. Helena, CA). Their high-end experience has most certainly been carried along with them to ONE. There are two entrances for this restaurant. 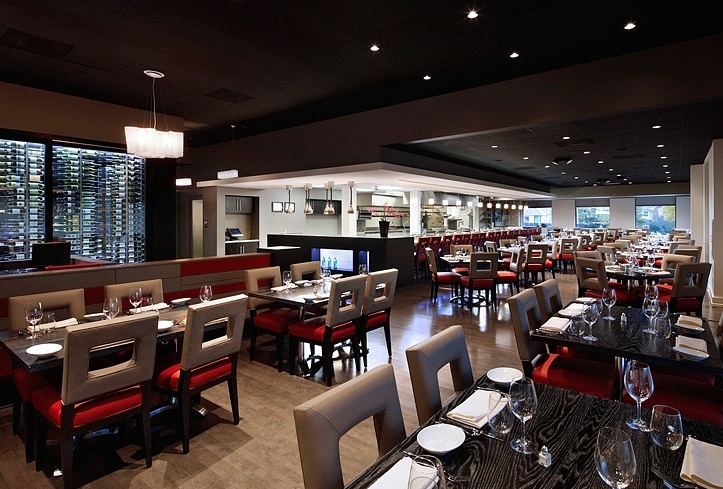 The one on the right is the main entrance to the restaurant, while the left door leads to the bar and lounge area. 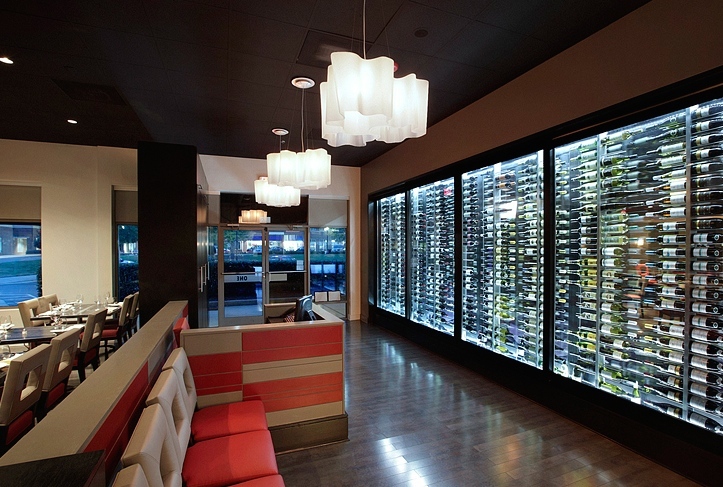 Each area is easily accessible to the other inside and are only simply and partially separated by a wall of wine in a lit-glass cellar. However, each holds their old modern style. The lounge is comprised of tables with comfy couch-like chairs, high-top tables, and bar seating. The lighting is more dim and romantic in this section; however, you may easily see you food if you decide to dine on this end of the restaurant. The bar also has six flat-screen TVs showing both cooking and sports channels, so you can either learn more about food or enjoy an awaited sports match while you wait for a table or dine in the lounge. The bartender is also a great source of information, so if you shall have any questions, he is always happy to help. The main restaurant portion is seen in the pictures above and below. There is lots of seating, but on a weekend I would still suggest making a reservation. As my friend and I wanted to try a variety of the dishes served from the menu, we ordered a few of the small plates offered from each section. The menu is comprised of three sections: ‘Roots & Bounty,’ ‘Land & Sea,’ and ‘Sweets.’ The restaurant also offers two different tasting menus: 4 customer-selected courses or 6 chef-selected courses – both also offered with a wine pairing, if preferred. Note that the main ingredient in each dish is marked by brackets on each line item within the menu. Our first course was the Silver Queen Tortellini with creamed corn and tiny basils, above. The corn was not overpowering and the basil gave the dish just the right touch. 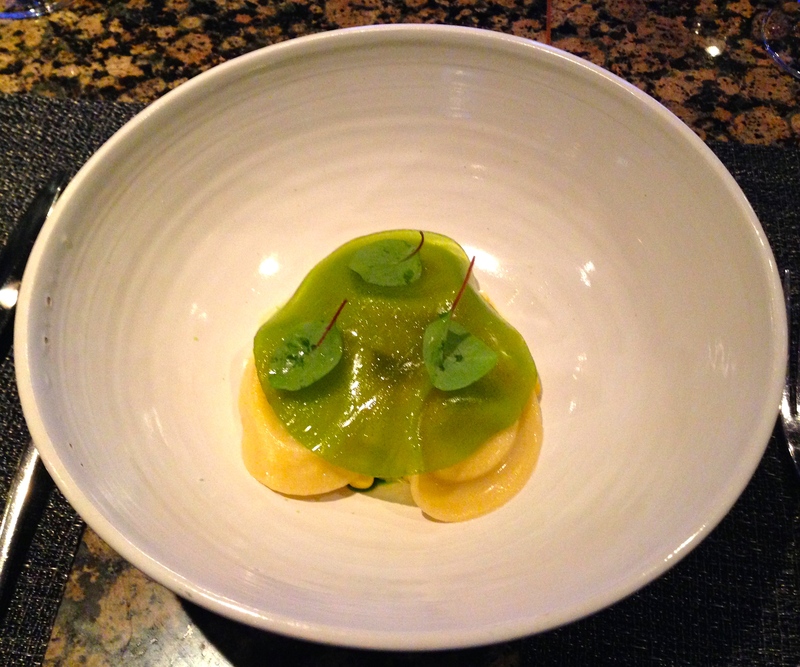 The tortellonis were laid upon a bed of corn and basil, buttered to perfection. 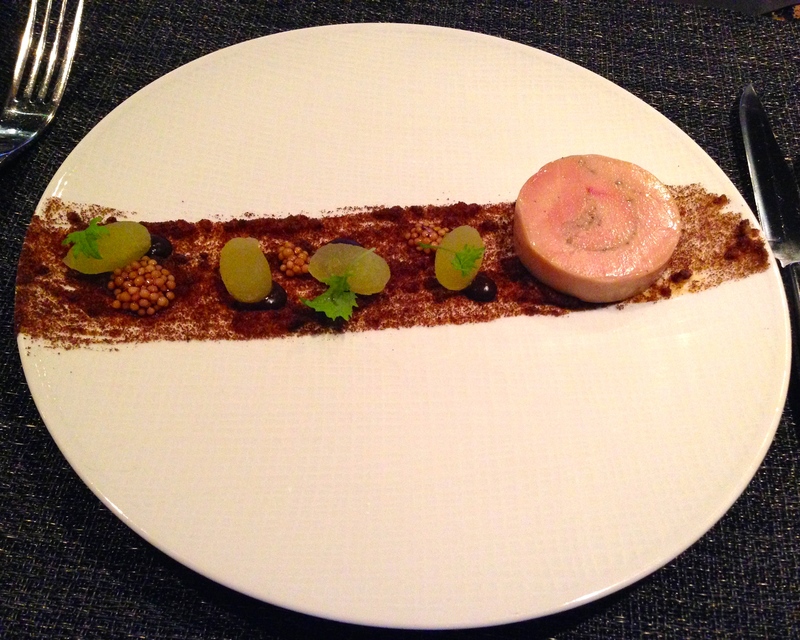 Our second course was the Foie Torchon, served with green apples molded to the shape of grapes, mustard, and pumpernickel. All of the ingredients were laid upon a streak of powdered chocolate that surprisingly brought the flavours of the whole dish together in a remarkable way. Absolutely scrumptious. I highly recommend trying this dish. For the third course, we had a more southern dish of whole, seasoned, steamed shrimp under a bed of beans and pressed leaks. This was a simpler dish than the rest, but it was light and savory. I suggest eating the whole shrimp for the most flavour, should you be so adventurous. For dessert, we tried two dishes. The most impressive as far as presentation was the sugar glass Faux Peach (above) with semolina, bourbon caramel, and sliced peaches. 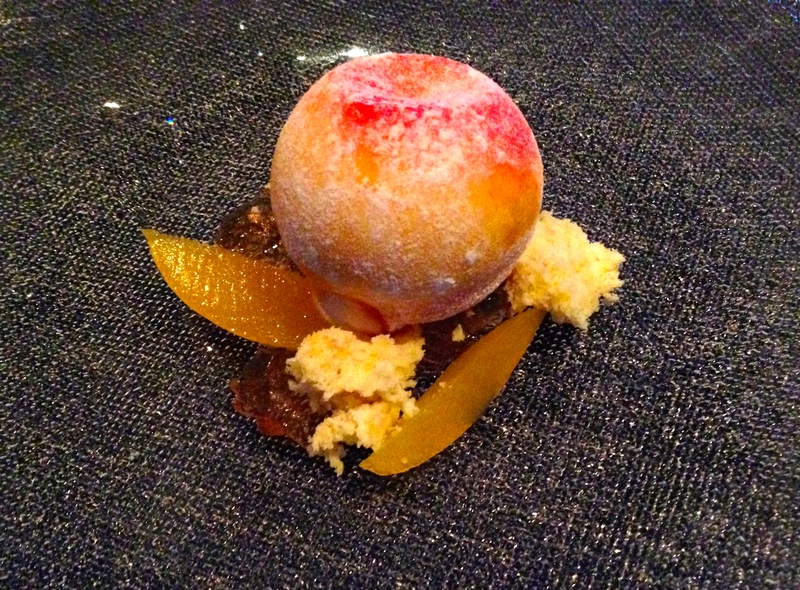 Upon arrival, it truly looked like a real peach covered with powdered sugar. 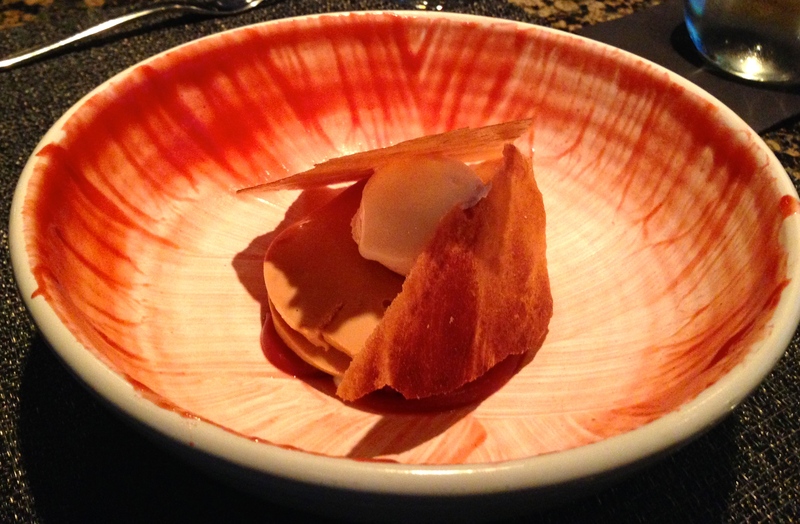 The other dessert (below) was the Raspberry Custard with fresh gelato. Don’t be deceived; the red streaks are actually raspberry sauce to use while eating this dessert. We didn’t think we would be able to eat two entire desserts, but they were so light and refreshing, we did not leave one morsel on the these dishes. Definitely will return to try more.